This recipe comes from the Martha Stewart’s Pies & Tarts cookbook that was first published in 1995. It’s my sister’s signature dessert and she makes it better than anyone including, I think, Martha! The secret to her success is to cook the apples in the caramel for a very long time. 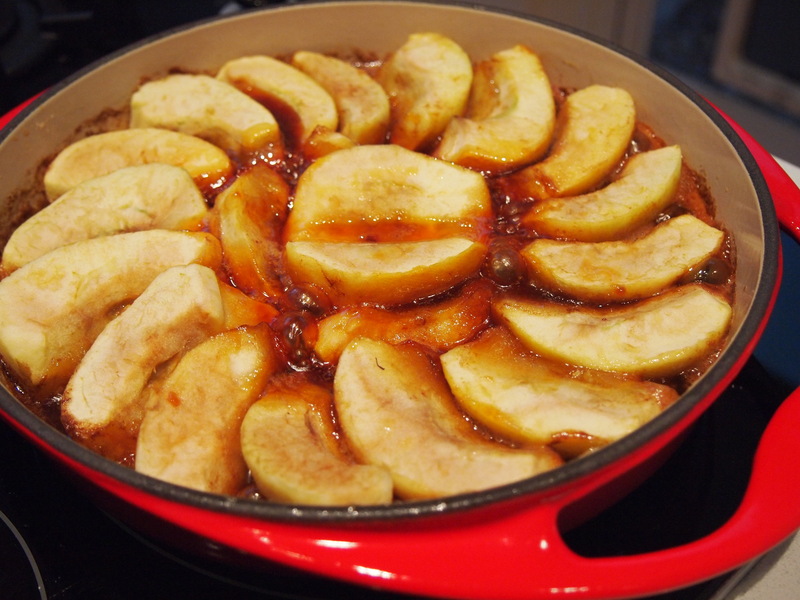 Martha stipulates 20 minutes in her recipe but I followed my sister’s advice and cooked them for upwards of an hour and the extra cooking time resulted in the most amazing dark caramel and fork tender apples. Most recipes for Tarte Tatin use puff pastry but in Martha’s version a shortcrust pastry is used and it’s so much better. Puff pastry is delicate by nature and once the tarte is inverted I find the puff pastry becomes soft and soggy. I highly recommend a Le Crueset, or similar, cast iron pan for this, you need a vessel that can be transferred from the stove to the oven. Le Crueset manufacture a specific Tarte Tatin dish which is what I use but my sister has a Le Crueset cast iron skillet which works equally well. In an 9 inch cast iron skillet (tarte tatin dish or other oven proof sauté pan) combine the sugar and water. Bring the mixture to a boil, lower the heat, and cook over medium heat until it begins to thicken and turn amber coloured. It’s important to just swirl the pan and not stir it. Remove from the heat and add the butter. Halve and core the apples. 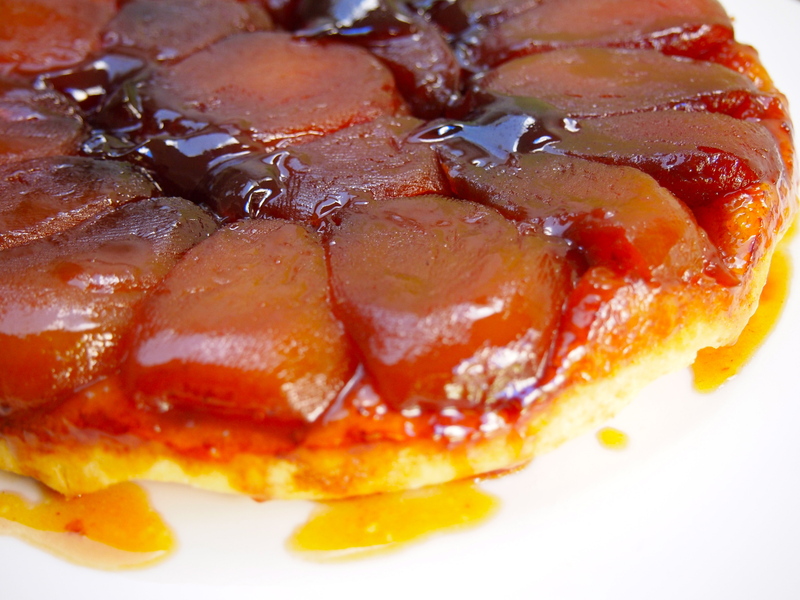 Leaving half an apple for the centre of the tarte, quarter the rest of the fruit and decoratively arrange the slices around the edges of the skillet on top of the caramelised sugar, cut side up. 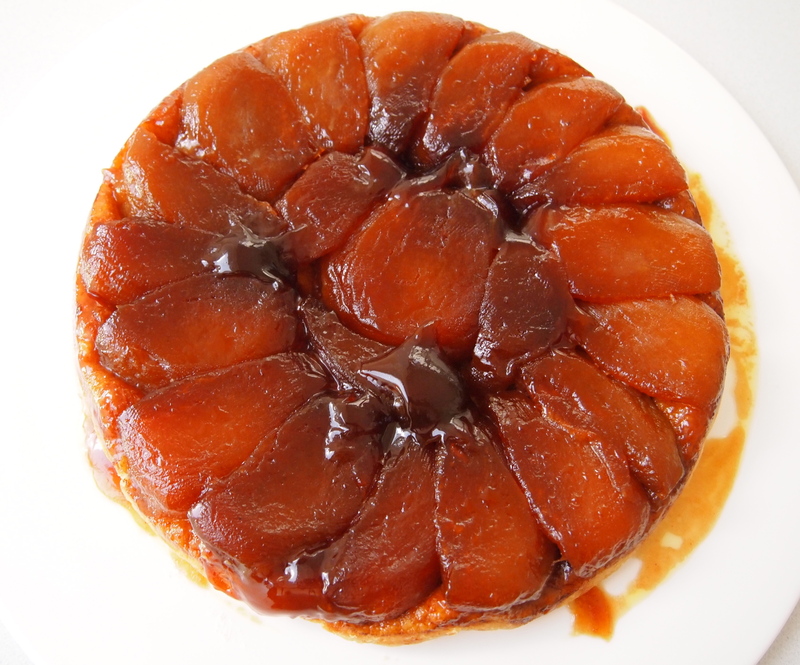 Remember that since the tarte tatin is inverted after it’s cooked, the fruit on the bottom will be visible when served. Place the apple half in the centre. Return the skillet to the stove and cook over low heat for about an hour. 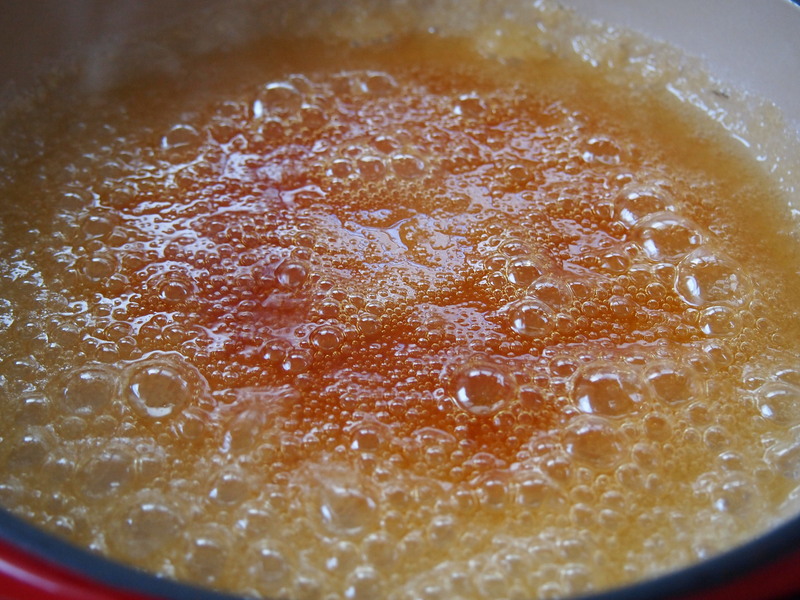 Make sure your heat is low enough that the caramel is just very gently bubbling away. 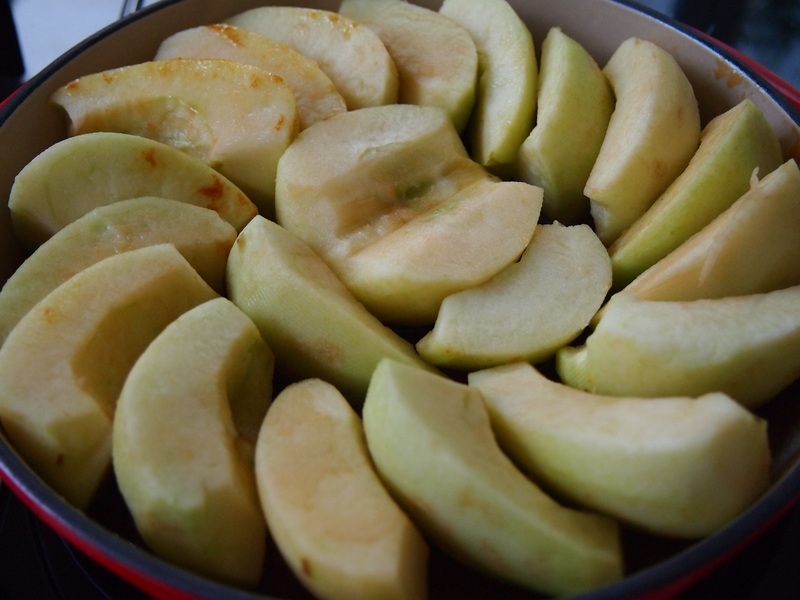 At the end of the cooking time the apples will have shrunk a little and the syrup thickened. Do not let the syrup burn. Remove from the heat and let it cool down to room temperature. Preheat oven to 180C. Roll out the pastry to a thickness of 1/8 of an inch and place it over the apples. Trim the edges. You can poke the pastry into the sides of the dish but I actually made a rim around the dish and sealed it against the dish. Bake the tarte for about 30-35 minutes, until the pastry is golden brown. 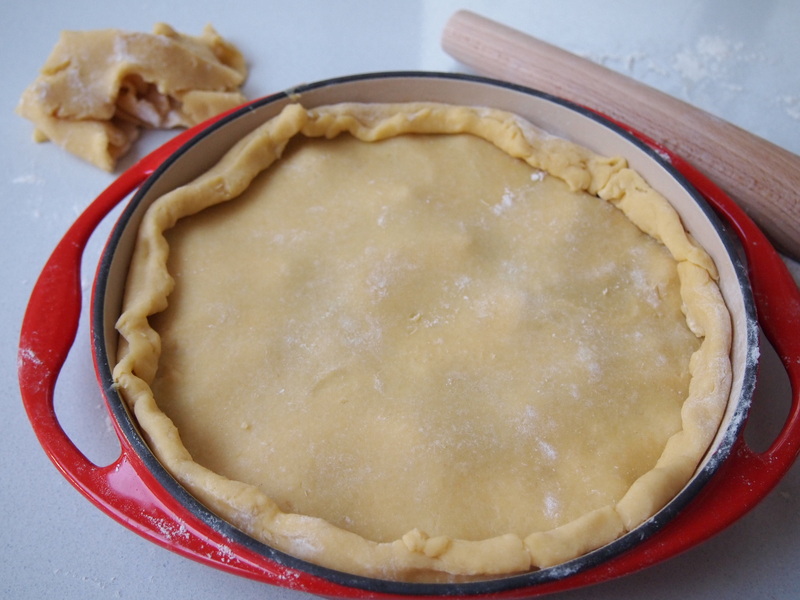 Remove from the oven and let it cool for 15 minutes, then loosen the pastry form the pan using a sharp knife. 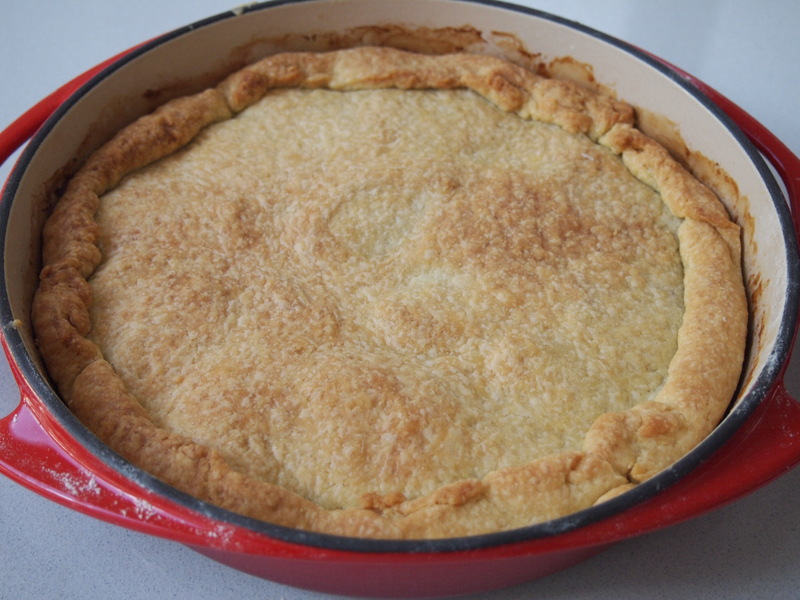 Place a serving dish or platter over the tarte and quickly invert. So who are the lucky people that go to eat this?! I’m very pleased to find this great site. I want to to thank you for your time for this fantastic read!! Thank you for the kind comment – it’s lovely to know that you have read and enjoyed my posts/recipes.